Shortly into Country Roads: The Music of John Denver, creator and host Dennis Curley tell us a story about his aunts and uncles sitting around the living room laughing, telling stories, and singing songs of the great singer/songwriters of the '60s and '70s, including John Denver. Dennis has successfully recreated that experience on the stage of the Plymouth Playhouse. He's not trying to imitate John Denver, or tell John Denver's life story, he's simply singing the songs that he loves and sharing what this music means to him, his friends and family, and the audience. There's really no theater here; it's a casual concert of one John Denver fan (and his awesome band) singing to a roomful of John Denver fans, who are encouraged to sing along. 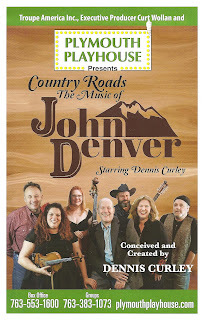 If you're a fan of John Denver, Country Roads is a must-see to experience all of that John Denver goodness. If you're not a fan of John Denver, well, you're missing out on some great music! Dennis is an entertaining and personable host of this informal living room session of songs and stories. He sings many favorites, including the title song, "Leaving on a Jet Plane," my personal favorite "Annie's Song," and "Rocky Mountain High," to name but a few. But he also shares a few lesser known songs, including the lovely piano ballad "Seasons of the Heart." These are faithful interpretations* of the songs we know and love, which Dennis sings beautifully (even when fighting a cold as he appeared to be yesterday, although you wouldn't know it from his voice). Adding lovely harmonies in many of the songs is Dorian Chalmers. Dennis plays piano on a few songs, and is supported by a fantastic five-piece band. It's a nice mix of quiet moments and rousing toe-tapping numbers. 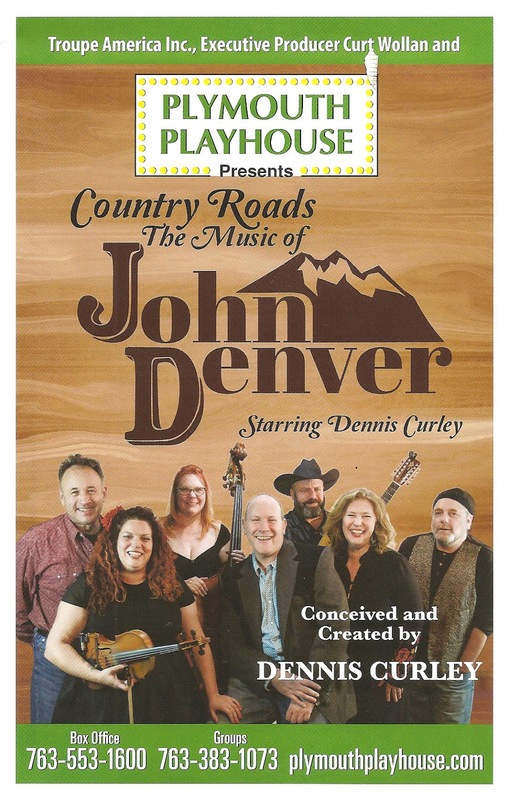 Throughout the show we get to know a little bit more about John Denver through people's stories about him (the audience is encouraged to share their stories as well), and we also get to know Dennis through his experience with John Denver's music. It's a celebration of the music that has a special place in many of our hearts and histories. For me, it's the nature-spiritual elements of John Denver's music that I connect to; I find it soothing and inspiring. Whatever your favorite John Denver song is, or whatever his music means to you, Country Roads will bring you right back to that happy place (Country Roads continues through May 1). *If you're interested in different interpretations of the John Denver catalog, I highly recommend the 2013 anthology album The Music is You, in which artists as varied as Amos Lee, Emmylou Harris, Old Crow Medicine Show, and Train put their own spin on the songs, showing the strength and versatility of John Denver as a songwriter.